A buddy of mine came to me early in December and asked whether I could help him build his model of the Star Wars X-Wing. His modelling skills is developing and he didn’t want to ruined the model. Fair enough then. When he said it was the Bandai kit, I didn’t hesitate to say YES! (I really wanted to leap out as this kit has been getting top notch reviews on the web!). He handed two kits, both from Bandai and both are X-Wing fighters. one is a 1/72 scale and the other is the 1/48 movable kit. Between the two, I would prefer working on the smaller scale just so that I can get acquainted better. If there are any hiccups, then I would have to deal with it in a smaller scale. The wings are movable but you need to be extra careful, the plastic is a bit brittle. A really cool project to end the year of 2015. 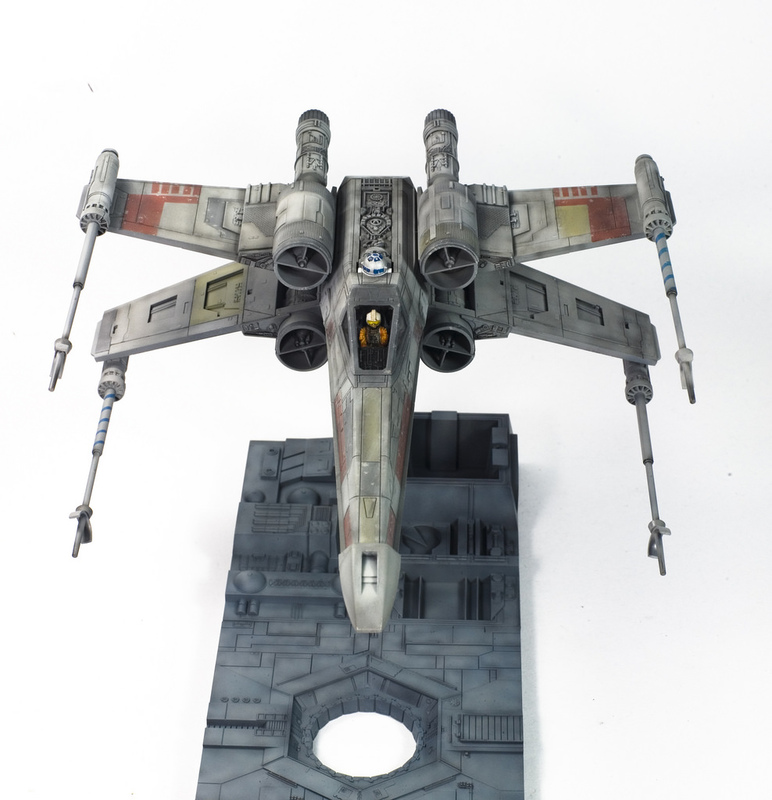 This Bandai X-Wing Starfighter in 1/72 scale is a blast. A very well engineered model. I seldom do snap-tights but this was a blow of fresh air from all my scale building project. It comes with a base so that you can display it in a ‘flying position”. I completed this about 40 minutes prior to midnight December 31, 2015. very close call but I made it alright. Not your ordinary plastic model. The way the Bandai kit works is a bit unique. You have to approach it differently than your ordinary aircraft model (though this is still define as an aircraft – albeit a space craft). Painting Wings. You need to paint the inner side of the wing first, before they are attached. this is because there is very little space for you to work with an airbrush. it just wont get all the deepest corners. and also, if you want to do weathering and washing of the inner side of the wings, do it NOW too. Wing-Fuselage. Keep this later after the wings are painted first. Then you can put the lower fuselage together with the wings. the upper part is a different affair. see text below. Pilot. If you opt to show it as if it is flying, then you need to put a pilot inside. Bandai gives you two – standing position and sitting in the cockpit. if you opt for the flying style – then you have to paint the pilot first, and insert it into the cockpit before you can install the cockpit’s dashboard and close the fuselage halves. They way that Bandai has engineered is that the pilot’s legs acts as a locking mechanism so it just has to go in first. (unless you want to sow it off). Now this was a bit of a throw off on my mojo. I was just about to close the halves when I realized that I can’t fit the pilot in (still unpainted). I am glad that I did not glue any of the parts so it was a very easy fix. 1/48 (left) and 1/72 (right) pilot figures. Bandai gives you two unpainted figures in the box. R2-D2. This goes for the R2 unit as well. the instruction says you can install it LATER. but in fact you need to insert the droid well BEFORE the top and rear end of the X-Wing is installed. The R2 Unit details were hand painted. the chrome dome receive Mr. Color 8 Silver while the blue panels got XF-8 Flat Blue painting using a ‘0000’ Windsor&Newton pointed brush. Painting. I decided that I will paint the X-Wing and weathered it just so it looks as if it escaped the Death Star. I spend approximately 11 hours in total. the construction went from only about 2 hours. the rest is the painting, weathering and finishing process. All paints are Tamiya enamels. they ‘greys’ are a mix of Tamiya XF-20 Medium Grey, XF-21 Sky Grey, and XF-2 Flat White. They were airbrushed in layers, or in a mix of either of the two combination. once they are sprayed on top of each other, they build opacity and a very rich blend of greys. While the panelings are provided with decals and stickers, I prefer to paint all of them. The paints are XF-60 Dark Yellow, XF-8 Flat Blue, XF-63 German Grey, XF-7 Flat Red. The “Death Star” base is a layer of XF-63 and XF-20 misted over Gunze’s Mr. Surfacer 1500 Black. and it didn’t take more than 15 minutes to do it. its a very straight forward affair. The X-Wing just prior to inserting the figure pilot inside the cockpit. I had to paint the wings prior it being installed into the fuselage. Weathering. Is done by making streaks using thinned XF-1 Flat Black (ratio of 1:7 thinner). While the chipping effect is by dabbing foam on to certain areas of the panels, with a bit of a thinned-down version of the base color. I use the same technique to do the ‘metallic’ chipping, using Tamiya XF-16 Flat Aluminum. I used Tamiya Panel Line Accent (TPLA, black) for the washing of panel lines. never use the brush in the bottle! A better alternative is a good quality ‘0’ or ’00’ pointed brush with natural sable. its worth the investment. The only problem with the TPLA is that my paint is enamel and those two do not mix. I have tried putting a gloss layer of Future on top, but still I did not work well. It was hard to clean up the Panel Accent wash. I had to use cotton buds wet with Mr. Leveling Thinner. even that, it was a bit too strong for the Future. Some of the base paint lifted and diluted under the swab. I would better stick with acrylic washes in these cases. Bandai provides stickers and decals to make the different panel colors. but its way better if you paint them. Handling. To my surprise, the plastic seems to be a bit brittle. I had three cases where some of wing-mounted laser canon parts cracked. This is pretty much how I do my aircraft builds and I thought it was just the same way with an X-Wing. proved me wrong. Looking back, I might have opened or closed it too much during the painting process. may be its just best to detach the laser canons when the kit is almost complete. The chipping effect was achieved by dabbing a piece of foam with thinned down paint.